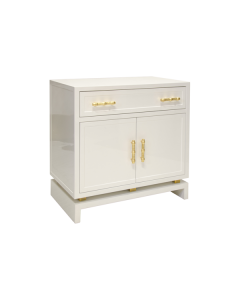 This lovely nightstand features a white lacquer finish with a beveled mirror top. Create an exotic Asian-themed bedroom with this simple, zen-like Pagoda nightstand. The nightstand measures 24"W x 20"D x 29"H and features two drawers. Click on image for greater detail.